I am reading them, and may post summaries of and interesting points about Marx’s life, but broken down into manageable periods. In the post that follows I sketch Marx’s life between 1818 and 1841. Karl Marx was born on 5 May, 1818 in Trier, which was then part of the German state of Prussia. Marx’s parents were Heinrich Marx (1777–1838) (who had been born with the name Herschel Mordechai) and Henrietta Pressburg (1788–1863) and his ancestors Jewish rabbis and merchants from Trier and Bohemia (Sperber 2014: 6–7). The social and economic life of Trier had been transformed by its formal annexation into the French revolutionary Republic, along with other German territories on the left bank of the Rhine, in 1797, when the French government had swept aside the ancien régime in their German territories (Sperber 2014: 7–9). During the Napoleonic empire, Heinrich Marx, Marx’s father, had been an official in the Tier Jewish Consistory and had then studied law at Koblenz from 1813 (Sperber 2014: 14). After the final defeat of Napoleon in 1815, Germany was politically fragmented into many different states, as you can see in the map here. 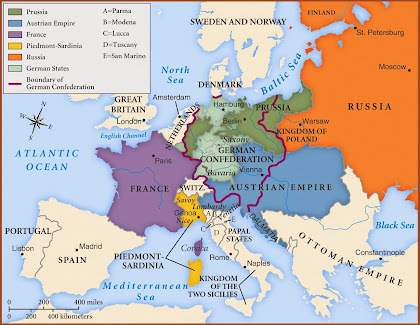 Marx grew up in a conservative Europe in the age of Metternich after the new political boundaries of the European states had been settled at the Congress of Vienna, as we can see in the map below. With Napoleon gone, Trier and most territories in the Rhineland and Westphalia became part of Prussia from 1815, and in 1814 Heinrich Marx had returned to Trier to become an attorney (Sperber 2014: 18). Around 1819 he converted to Protestant Christianity to continue working as a lawyer under Prussian rule (Sperber 2014: 17). Heinrich had also changed the family surname in around 1808 from “Levi” to “Marx,” which is apparently an abbreviated form of Mordechai. Heinrich Marx also appeared to be a strong advocate of Enlightenment views, which he taught the young Karl Marx (Sperber 2014: 19). Heinrich Marx had married Henrietta Pressburg in 1814, who came from a Dutch Jewish family (Sperber 2014: 20), and they had 9 children from 1816 to 1826. Marx had rather bad relations with his mother later in life (Wheen 2001: 8), especially after the death of his father in 1838 and his financial difficulties. Karl Marx was born in 1818, was baptised as a Christian in 1824, and received private education at home until 1830 (Sperber 2014: 25). In 1830 he entered an elite Gymnasium (a secondary school) at Trier where his education was heavily focussed on the Classics (ancient Greek and Latin language and literature) and he graduated in 1835 (Sperber 2014: 25–26). Amongst his friends at school was Edgar, the son of a Prussian bureaucrat and aristocrat called Johann Ludwig von Westphalen (1770–1842), whose daughter Jenny eventually married Marx. In his final exams, Marx did well at German and Latin but poorly at mathematics (Sperber 2014: 27). In 1835 Marx entered the University of Bonn to study law and public administration, where he became associated with the League of Poets and a group of German Rheinland students (Sperber 2014: 38). He seems to have fallen into a rather riotous life at Bonn: he neglected his studies, drank heavily, became co-president of the Trier Tavern Club (a society devoted to hard drinking), got himself arrested for 24 hours, and even fought a duel in summer 1836 with a solider in which he received a wound above the eye (Sperber 2014: 38–39; Wheen 2001: 16). His father was naturally unsatisfied with his progress and way of life at Bonn and so transferred Marx to the University of Berlin. In 1836, before leaving for Berlin Marx became engaged to Jenny von Westphalen (1814–1881) (Sperber 2014: 41). At the University of Berlin, Marx became interested in the philosophy of Georg Wilhelm Friedrich Hegel (1770–1831), who had died in 1831. By 1837 he was a follower of Hegel and neglecting his studies, all to his father’s intense disapproval (Sperber 2014: 53– 55). In 1838, Marx visited his family in Trier to find his father on his death bed, and Heinrich Marx died three days after Marx left to return to Berlin (Sperber 2014: 55–56). Even by 1837 at Berlin, Marx became strongly involved with the Young Hegelian movement, a group of young radicals who were applying Hegel’s philosophy to various branches of the sciences (Sperber 2014: 61; Wheen 2001: 27), and above all to Christian theology, as in the work of David Strauss, Bruno Bauer, and Ludwig Feuerbach. Although originally an attempt to purify Christianity of its myths and get to its essence, many of the Young Hegelian critics ended up as radical atheists by the 1840s; they also identified with liberal causes, and came to apply a Hegelian critique to politics (Sperber 2014: 63–64). Marx was very much a younger member of Young Hegelian generation (Sperber 2014: 64), and had a personal relationship with Bruno Bauer – so much so that Marx has been seen as Bauer’s protégé (Sperber 2014: 66). Under Bauer’s influence, Marx became an anti-religious atheist. By late 1839, Marx had embarked on his Doctoral dissertation called The Difference between the Democritean and Epicurean Philosophy of Nature, which was a comparative study of the ancient materialistic philosophies of Democritus and Epicurus who were both ancient advocates of an atomic physics. However, in the course of writing his dissertation Marx ceased to be a student at the University of Berlin since he had studied for the maximum for 4 years without getting his degree and had failed to apply for an extension (Sperber 2014: 66). Marx was, however, able to submit his dissertation to the University of Jena and it passed on April 15, 1841 (Sperber 2014: 70; Wheen 2001: 33). After this, Marx returned to Trier in June 1841, and had firm plans to be an academic (Sperber 2014: 70), but the Prussian state had entered a period of pronounced hostility to the Young Hegelians and Marx’s mentor Bruno Bauer was dismissed from the University of Bonn in March 1842 (Sperber 2014: 71, 75). At the same time, Marx, who had gone to Bonn after his return to Trier, saw his prospects for an academic career destroyed (Wheen 2001: 34). Which book is better and which do you recommend? "Marx was very much a younger member of Young Hegelian generation (Sperber 2014: 64), and had a personal relationship with Bruno Bauer – so much so that Marx has been seen as Bauer’s protégé (Sperber 2014: 66). Under Bauer’s influence, Marx became an anti-religious atheist." This looks wrong. Bauer was the best of Hegel's students. He visited Marx and encouraged him to read more Hegel at one point. Marx's philosophy mainly goes back to Feuerbach (probably the worst of Hegel's followers). On a side-note, it was through the Hegelians that a certain type of religiosity crept into Marxist thinking. Hegel was a Christian and key components of his philosophy -- specifically the Romantic components -- were definitively Christian. Much of the Marxist stuff about 'alienation' and all that is an attempt to secularise Christian principles. It was from about 1843 that Marx started to reinterpret his Hegelianism along the materialist lines developed by Feuerbach. Sperber (2014) discusses this on p. 112ff. Around 1837-1842, Marx was strongly influenced by Bruno Bauer.